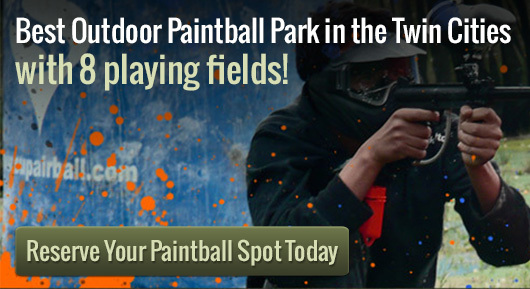 Looking to host or attend paintball events in Minnesota? Action Packed Paintball Games is the ideal spot in the Twin Cities for fun. Both groups and individuals are welcome seven days a week from dusk to dawn. If you’re planning paintball events, book at least one week earlier than your party to be sure to get the date you want. Call at 952-492-6776 to begin making a reservation or to get all your questions answered. The reason paintball is so great for parties, events, or just a day out is that it’s one of the few sports that put everyone on an equal playing level. Games can be for elimination, where you try to get rid of as many people off the opposing team as possible, or to capture the enemy’s flag and bring it home to your team’s base. Action Packed Paintball Games would love to host your paintball events. Whether you’re planning a birthday party or a bachelor party, your entire group will have fun. Choose from multiple courses and enjoy perks such as indoor restrooms, a spectator area for those who just want to watch, and dining accommodations. Players of nearly any age are welcome to join in. Many paintball events can be learning tools as well as fun. Youth groups can spend a day playing while learning teamwork skills with adrenaline filled tactics. Groups will have their own host and private use of the playing field. Paintball is also ideal for corporate events. Teamwork skills are enhanced among coworkers while enjoying an activity that puts everyone on the same level. It helps develop skills in fast thinking and quick decision making as a team. Watch employees build communication skills while having the time of their lives.